Don't let drivers say "We did not know what the speed limit was in your park." Slow them down! Communicate your park speed limit effectively with our Speed Limit 15 aluminum sign. 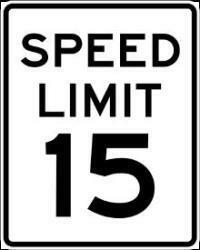 Go to top of this 12 x 18 Speed Limit 15 Reflective Aluminum Sign page.